Banh Mi Boys | I'm hungry, let's get some food! Several years ago a small and narrow sandwich shop opened up at Queen and Spadina. At first I thought, “how can this compete with the dirt cheap bahn mi sandwiches all along Spadina?” Then I ate the food and have never second guessed them since. I still remember my first experience, walking down the street with one of the tacos in hand. I had to stop and sit down on the sidewalk because my knees grew weak as the flavors burst in my mouth. HOLY FOODGASMIC BATMAN! This is one of the best things I’ve ever eaten! They’ve since opened a location and Yonge and Gerrard and I’ve been a regular ever since. When friends visit from out of town, this is one of the places I always send them to. 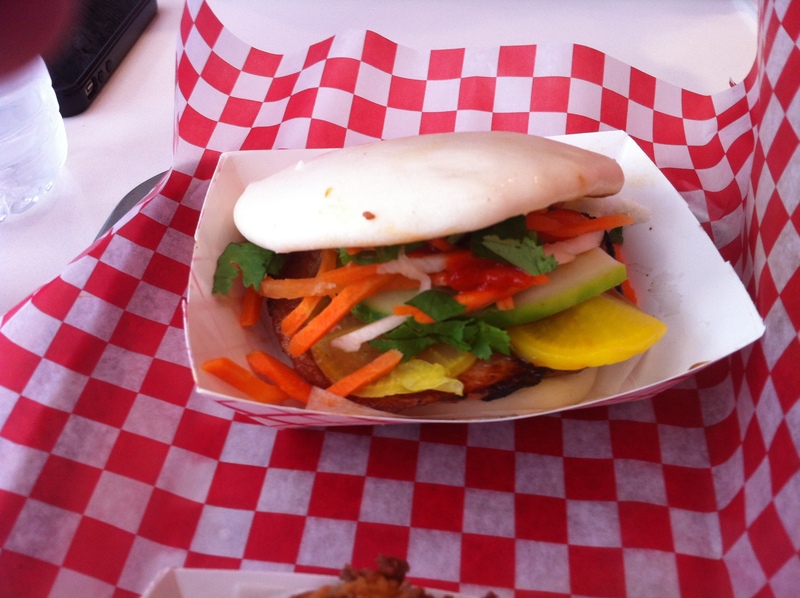 Below is the five spice pork belly steam bao. The bun is soft and chewy. Nice texture very reminiscent of the chinese buns you get at dim sum but bigger. The veggies are crisp and packed with pickled flavour. The meat.. tender, fatty and packs a lot of great flavour from the five spice seasoning. 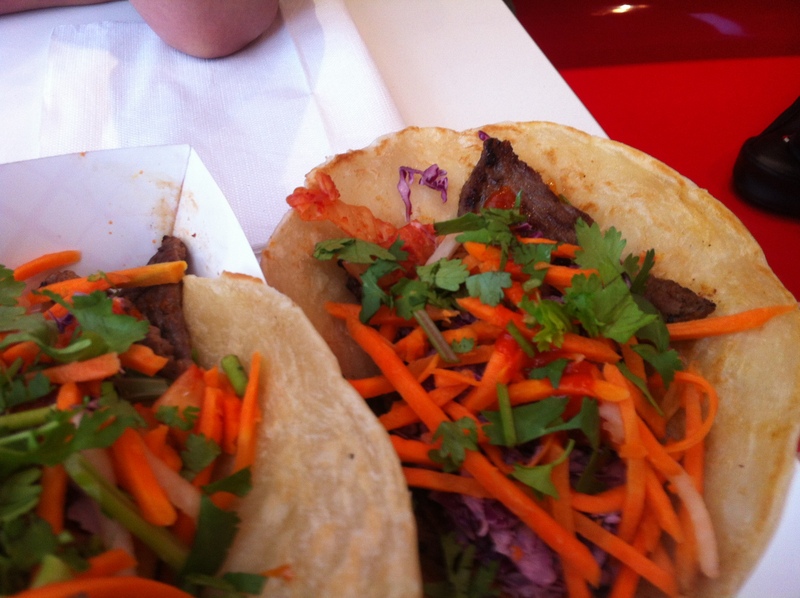 Below is the Kalbi beef taco. This was the original taco that brought me to my knees. The tortilla holds together well considering it’s packed with stuff. As you eat it, the sauces shoot down your hand so remember to grab napkins….or you can do what I do and just lick it all up. The beef is tender and full of Korean kalbi marinade flavor. Again the veggies are crunchy and full of pickled goodness. The heat is ever so perfect. The flavorful kind of heat and not simply a burning heat. 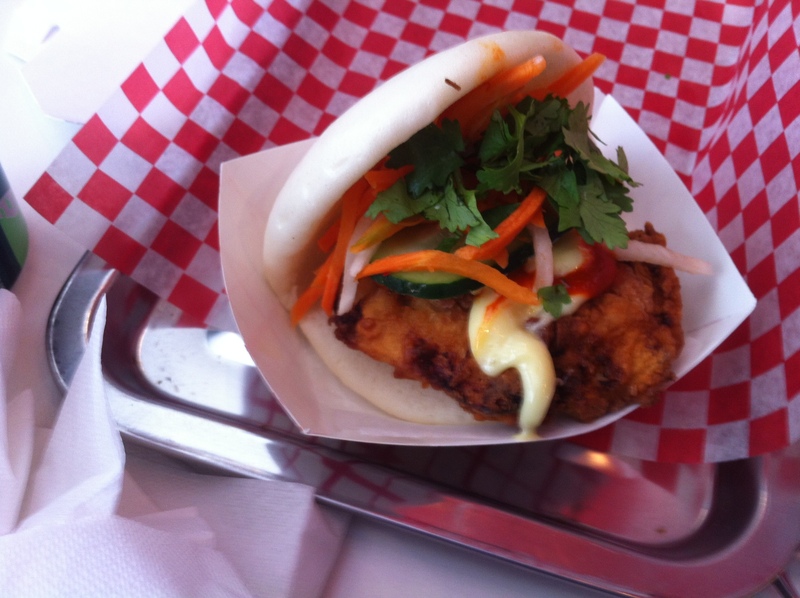 Below is the fried chicken steamed bao. I love fried chicken so this concoction just makes me happy. Crisp, juicy fried chicken with all the goodies included in the other options. The true winner and must try though, partially for uniqueness but mainly for flavor, are the Kimchi fries. 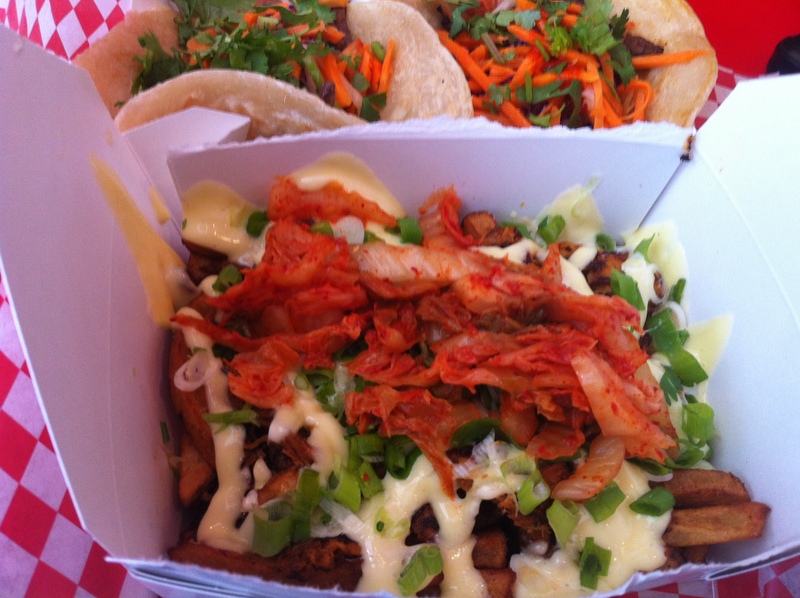 Kimchi, mayo, green onions, pulled pork, perfectly crisped fries….it sounds weird but it is truly a culinary work of art. 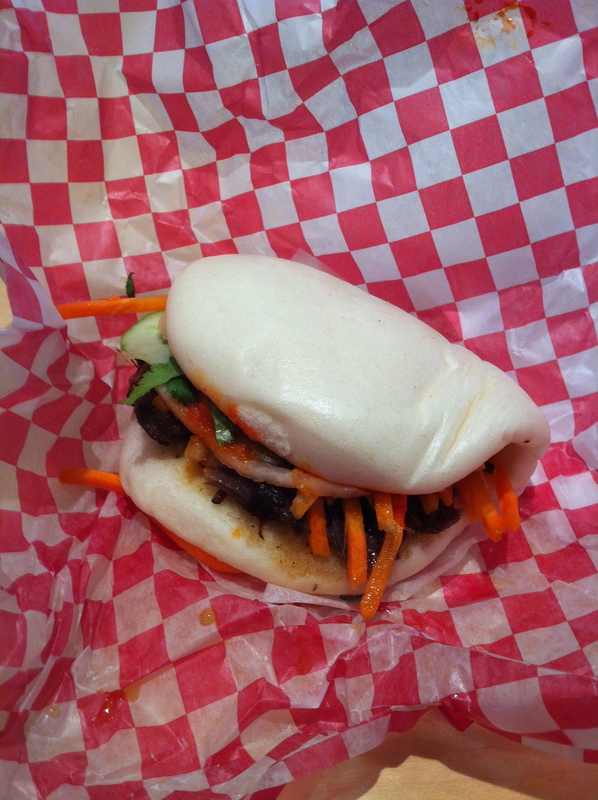 Below is the beef cheek bao. The beef is tender and absorbs a lot of the sauce. 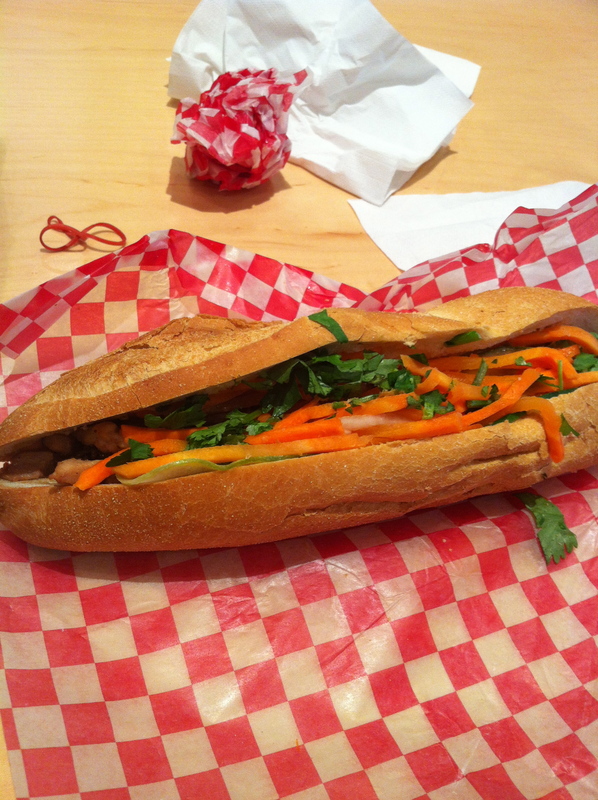 The bahn mi itself is on a lightly toasted french bun, crisp on the outside and doughy on the inside. Below is the chicken. Small morsels of marinated chicken packed with flavor. 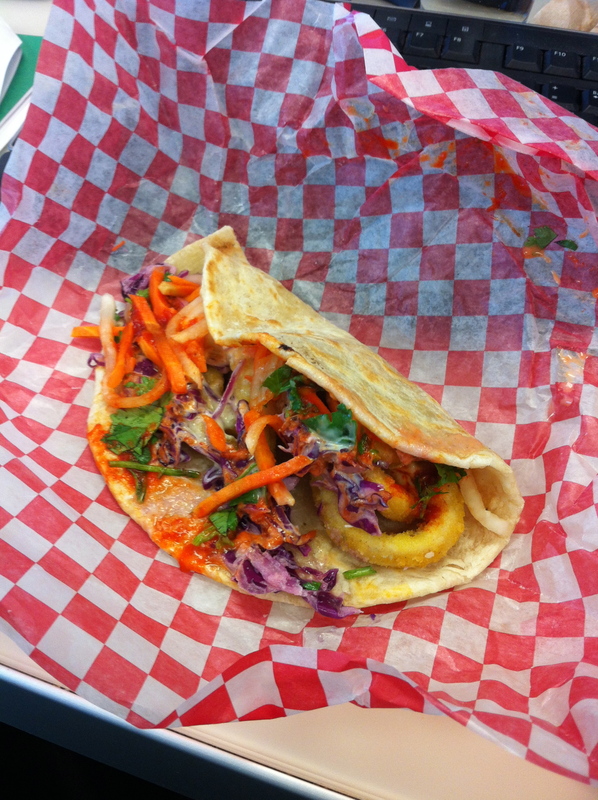 Below is the squid taco. The squid is a little rubbery and it doesn’t travel too well but fresh off the fryer, it’s as good as any fried calamari. 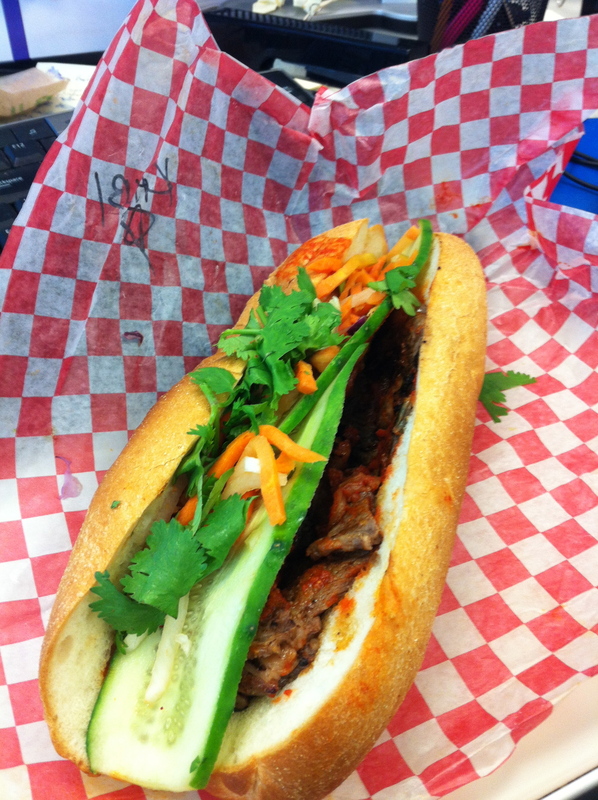 Below is the Kalbi beef bahn mi. Like the taco incarnation of the Kalbi beef, it carries the same punch-you-in-the-face flavor. This place is a real gem and probably one the best value meals in the whole city. How to mix a meal of the baos, tacos and sandwiches is a common debate amongst my friends and co-workers. To date, we have never come across a bad combination, it’s all just varying degrees of awesome. ~ by jlowjlow on March 25, 2017. This entry was posted on March 25, 2017 at 6:48 pm and is filed under Asian, Chicken, Fried, Fries, Fusion, Korean, Sandwiches, Seafood, Tacos, Toronto, Vietnamese.You can follow any responses to this entry through the RSS 2.0 feed.You can leave a response, or trackback from your own site.